Dream of the Sea (of Cortez). Sea turtles are such mysterious, charismatic creatures. If you love sea turtles, sea life or dive, then this is for you. Painted onto the glass on the backside of the glass, reverse glass painting or Verre Eglomise has a long history in European Painting where it has been known since the 14th century as a traditional painting technique. 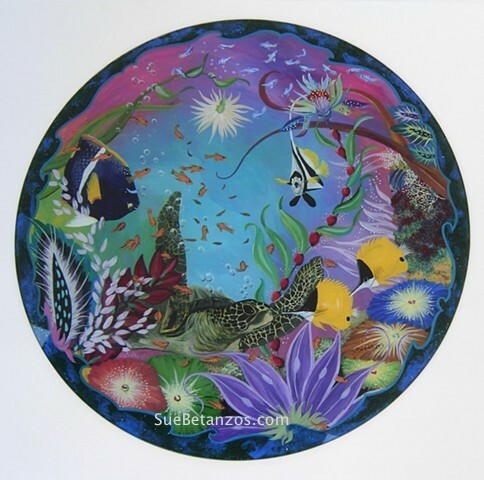 A rich, jewel toned contemporary glass painting that would be suitable for a small table or wall hanging. Round, heavy, beveled glass - Unframed.